Hollywood comedian and award-winning scribe Rick Najera and Mariachi-turned real estate entrepreneur Jerry Ascencio will star in The National Association of Hispanic Real Estate Professionals’ (NAHREP) Nuevo Latino Tour featuring the original live stage production of 53 Million & One. California tour dates have been announced with the first performance set to take place Tuesday, June 30 at 7 pm at the renowned El Portal Theatre in North Hollywood with a VIP red carpet and invited Latino celebrities. For tickets click here. Najera (from Hulu’s East Los High, Latinologues, MadTV, In Living Color) opens the show with comedy relief and excerpts from his latest award-winning book, Almost White: Forced Confessions of a Latino in Hollywood. Mariachi and real estate entrepreneur, Jerry Ascencio, illustrates the Hispanic-American experience through his personal journey from immigrant to successful real estate broker and devout family man. 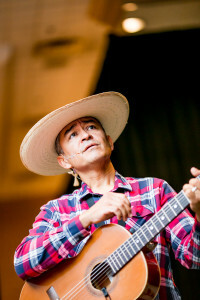 Ascencio narrates and embodies different characters in the performance and uses his skills as a Mariachi performer in a mélange of traditional Mexican music and American pop to tell his true-life story about making it against all odds. The show highlights the common challenges, experiences, and aspirations that bind the 53 million Latinos that call America home. Completing the show, Najera leads a lively discussion with the audience. The second wave of California shows will continue in November in San Diego, Sacramento, La Mirada and Costa Mesa and more to be announced soon. For more information, schedule and to purchase tickets in advance, visit www.nuevolatinotours.com and Facebook www.facebook.com/nuevolatinotours.